Before reading the First Seal, please read the following reports/breakdowns: Daniel Chapter 7 (The Four Kingdoms) and 2 Esdras Chapters 11 and 12 (The Fourth Kingdom). It should be noted that the prophecies’ concerning the seven heads of the beast, see Revelation 13:1 is the First Seal. The prophecies’ concerning the seventh head of the beast (The Eagle's right head, see 2 Esdras 11:35) is the Second Seal. That the seven heads of the beast are seven kings that shall rise to power in the earth. The vision of The First Seal represents the time period of wars and rumours of wars. It is a period of change wherein power shall be given to the seven heads of the beast/kings. The following prophesies are contained in The First Seal. It should be noted: That some scriptures will appear in both the First and Second Seals. However, the prophecies are different. 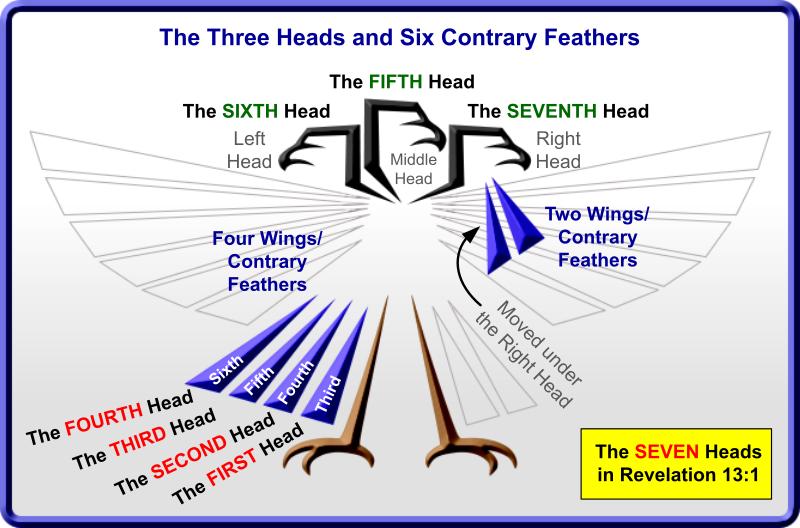 The Second Seal is the prophecies of the seventh (7th) head/king (The Eagle’s right head) rise to world dominance. Christ explains the signs/events/prophecies that will take place in the earth before he returns. Matthew 24:7: “For nation shall rise against nation, and kingdom against kingdom: and there shall be famines, and pestilences, and earthquakes, in divers places.” Explained below in 2 Esdras 12:21-28. Revelation 13:2: “And the beast” [The beast with seven heads and ten horns] “which I" [John] "saw was like unto a leopard, and his feet were as the feet of a bear, and his mouth as the mouth of a lion: and the dragon” [Satan] “gave him" [The beast with seven heads and ten horns] "his power, and his seat, and great authority.” See 2 Esdras 12:22-25. 2 Esdras 11:25-34 takes place in the First Seal (Revelation 6:1-2), it is also the beginning of the beast with seven heads and ten horns; the remaining four contrary feathers and three heads of the Eagle are the seven heads of the beast in Revelation 13:1. 2 Esdras 11:25: “And I” [Esdras] “beheld, and, lo, the feathers” [The third, fourth, fifth and sixth Contrary Feathers/kings] “that were under the wing thought to set up themselves and to have the rule." 2 Esdras 11:29: “And when they” [The fifth and the sixth Contrary Feathers/kings] “so thought, behold, there awaked one of the” [Three] “heads that were at rest, namely, it that was in the midst;” [Middle/the first head (The fifth head of the beast)] “for that was greater than the two other heads.” See 2 Esdras 11:4. 2 Esdras 11:30: “And then I” [Esdras] “saw that the two other heads" [The second and third heads (The sixth and seventh heads of the beast)] "were joined” [Awoken] “with it.” The head in the midst/middle (the great head). 2 Esdras 11:33: “And after this I” [Esdras] “beheld, and, lo, the head that was in the midst” [Middle, the fifth head of the beast] “suddenly appeared no more, like as the wings.” See 2 Esdras 12:26. 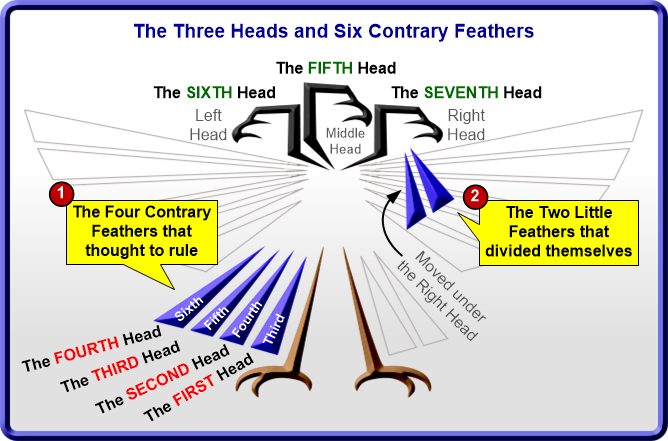 2 Esdras 12:21: “And two of them" [The first and second Contrary Feathers/kings] "shall perish,” [Die] “the middle time approaching:” [See 2 Esdras 11:22] “four" [The third, fourth, fifth, and sixth Contrary Feathers (The first four heads of the beast in Revelation 13:1)] "shall be kept until their" [The eagle's] "end begin to approach:” [The Signs of Christ's Coming, see Matthew 24:6-8] “but two” [The seventh and eighth Contrary Feathers (The Beast whose deadly wound was healed, and the False Prophet)] “shall be kept unto the end.” See 2 Esdras 11:24 and Revelation 13:3, 11-12. This diagram represents an overview of the First Seal.